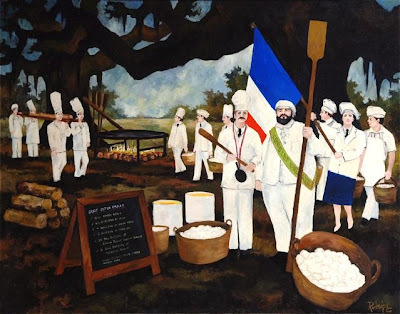 If George Rodrigue has a chef's counterpart, it’s Paul Prudhomme. They grew up in the relatively close Cajun towns of New Iberia and Opelousas, Louisiana. As young boys both pursued their passions as career goals, determined to hone their talents and define their lives with innovative, bold and personal contributions to the art of painting and food. Friends for thirty years, they support each other’s talents and efforts at festivals, fund-raisers, gallery exhibitions, and restaurant openings. On August 20th, 2011 Chef Paul and Rodrigue met on stage at the Manship Theatre in Baton Rouge, where one cooked while the other painted. Chef's assistant Shawn McBride and I moderated, as the auditorium wafted with the blissfully distracting scent of bronzing chicken and heavily-spiced andouille. George spoke first, sharing the story of his 1976 gallery exhibition in Boston, Massachusetts, where he was described as a 'Ky-yoon' artist. 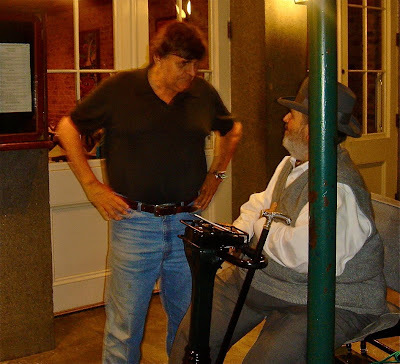 "It was Paul," explained George, "who introduced the Cajun culture to the world." Chef Paul responded with a French song, preparing the audience for the fun of witnessing these two Cajun greats doing what they love best. 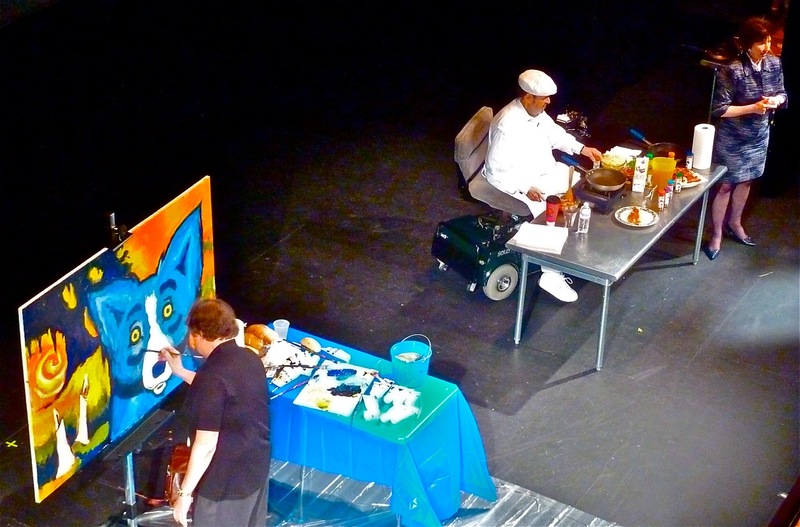 For ninety minutes, as the four of us bantered across the stage, even I was surprised at the parallels between Chef Paul and George Rodrigue. Notably, one produced the first national book on Cajun cooking, while the other produced the first national book on the Cajun culture. They both set out from the beginning to preserve what they feared at the time were dying aspects of Acadiana, one influenced by his mother's Opelousas kitchen, and the other by his mother's New Iberia photographs. 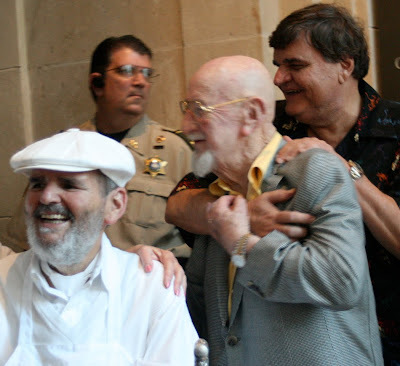 I first met Chef Paul in the summer of 1991 at the Rodrigue Gallery of New Orleans in the French Quarter. “Coffee with chicory, Dahlin’,” he requested with a smile. That fall he helped us open Galerie Blue Dog in Carmel-by-the-Sea, feeding and entertaining thousands of visitors. People called for months afterwards requesting reservations! 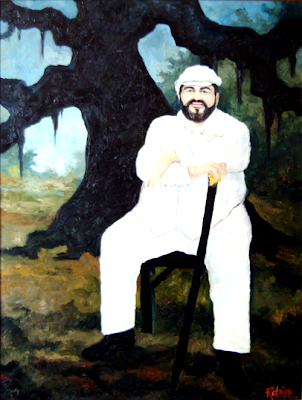 George Rodrigue painted Chef Paul's portrait three times. 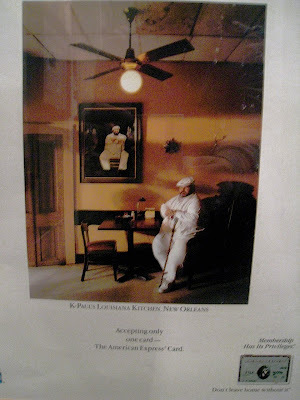 The most famous (above, 1989) commemorates K-Paul’s Louisiana Kitchen in New York City (now closed). The painting features Rodrigue’s typical style, showing the figure cut out and pasted onto the Louisiana oak tree; yet here George adds ‘the big apple,' also locked in the tree and framing Paul's head. Although barely discernible in a photograph, a redfish appears ghostly in the oak, referencing Prudhomme’s most famous dish, “blackened redfish.” Paul's feet echo the roots of the tree, indicating an inseparable bond between the Louisiana land and the Louisiana chef. The painting became famous when photographer Annie Leibovitz used it as the backdrop for her portrait of Prudhomme, widely circulated as a magazine ad for American Express. 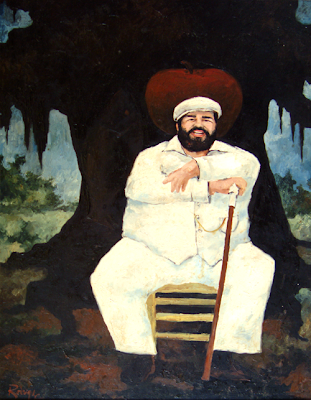 George also painted Chef in a large genre piece called The Great Cajun Omelet (1984, size 48x65, oil on canvas). The painting's story originates in the south of France where Napoleon and his army enjoyed a large omelet made from every egg in the town. The omelet became an annual Easter celebration to feed the poor of Bessiers. 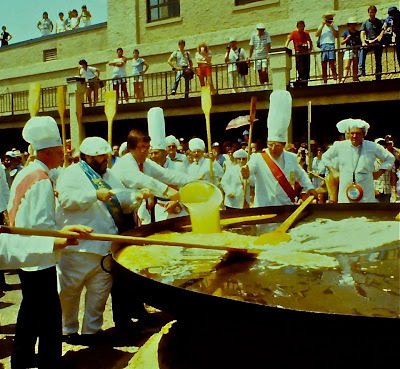 Since 1984 Bessiers' sister city, Abbeville, Louisiana, pays homage to this French tradition with an omelet made of five thousand eggs, distributed free at the festival. 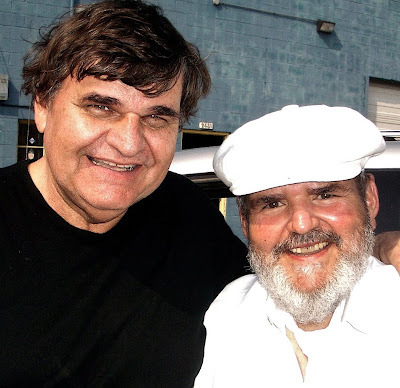 Although many chefs participate, it was Paul Prudhomme who first took on the challenge. 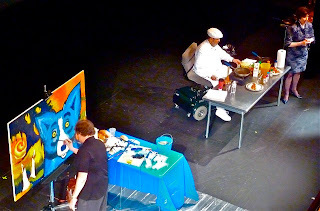 (Note: See The Great Cajun Omelet in Baton Rouge until September 18th, 2011 at the exhibition "Blue Dogs and Cajuns on the River" at the LSU Museum of Art). 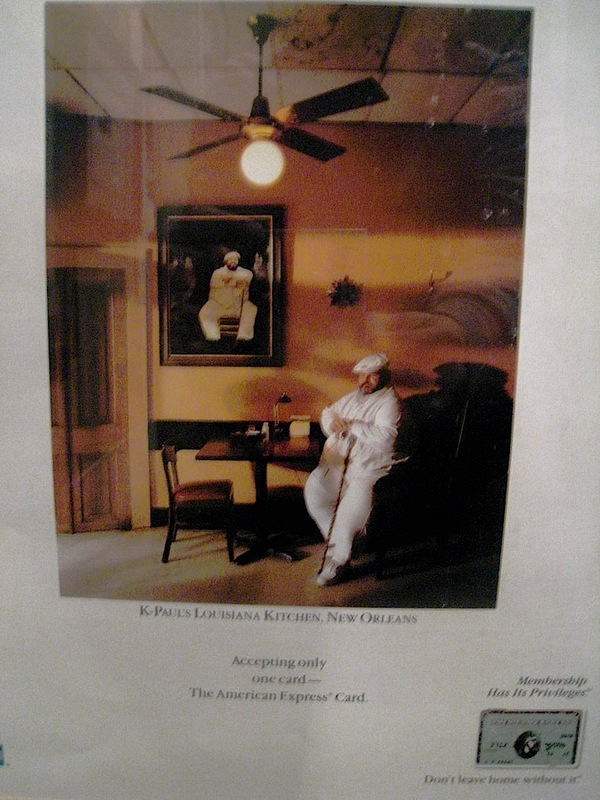 As a result, following Hurricane Katrina, K-Paul’s was one of the first restaurants to re-open in the city. George and I feel as comfortable at K-Paul’s as we do in our own kitchen. The restaurant abandoned the family-style seating and no-reservations policy years ago, in favor of small tables and white table cloths and, frankly, a packed house, booked weeks in advance. 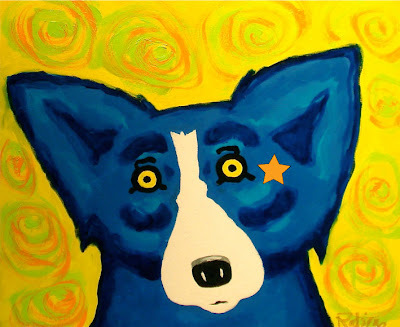 The restaurant is full of Rodrigue's paintings, including not only portraits of Chef Paul, but also a Blue Dog sporting a star on its cheek, a traditional reward at K-Paul's for finishing one's meal. 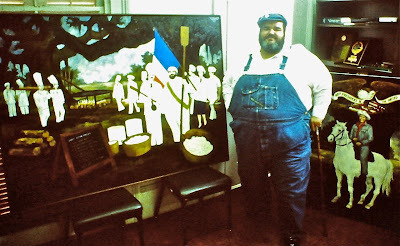 Paul Prudhomme is our neighbor in the Faubourg Marigny. George visits his test kitchen, adjacent to his house, where he shares new spices and special dishes. He has a remarkable gift for taste, and he relays easily every ingredient in a sauce simply from his palate. When I think of Chef I'm reminded not only of his outstanding, home grown, and innovative cuisine, but also of a regular guy --- down-to earth and full of kindness. He fed thousands of people out of his warehouse following Hurricane Katrina, without press attention or fanfare. Occasionally Paul and George drive in Chef’s pick-up to a casino in Belle Chasse, where they play poker (and where a quarter’s considered a big raise). They pass a good time with the locals --- a relaxing, easy evening for these Cajun friends. 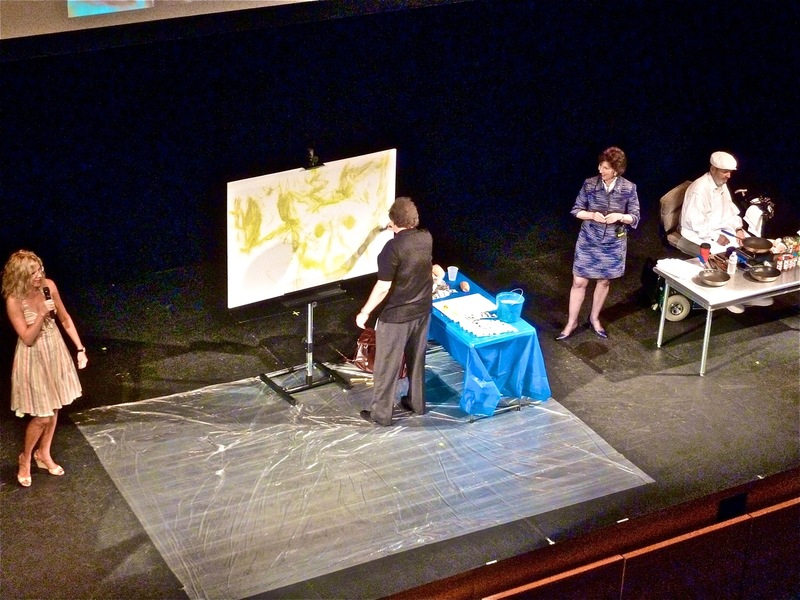 The two work naturally together, and this past weekend, as they left the stage laughing, they knew that they entertained the audience as much as each other. "Let's take this show on the road!" exclaimed Chef. Wide-eyed, George and Chef looked at each other, realizing the fun and possibilities. Stay tuned for the tour dates (seriously)! I have enjoyed all your stories!!! 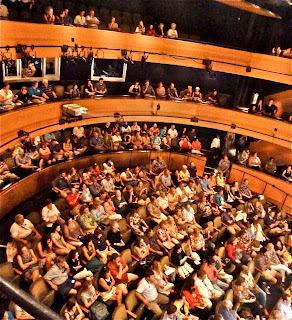 Would love to see you if you are ever in Dallas!